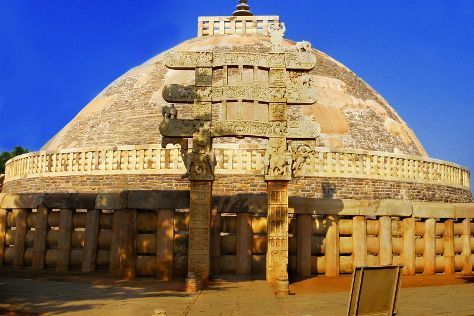 Change things up with these side-trips from Bhopal: Sanchi (Western Gate & Sanchi Stupas). Spend the 23rd (Tue) exploring nature at Van Vihar National Park. And it doesn't end there: explore the ancient world of Buddhist Monuments at Sanchi, explore the activities along Badi Jheel Lake, brush up on your military savvy at Yodhasthal, and browse the different shops at DB City Mall. For more things to do, where to stay, and tourist information, go to the Bhopal trip planner. In April, daily temperatures in Bhopal can reach 45°C, while at night they dip to 26°C. Wrap up your sightseeing on the 26th (Fri) early enough to travel back home.